We received product from sponsors for use at our event. As always all opinions are honest and my own. This post contains affiliate links. 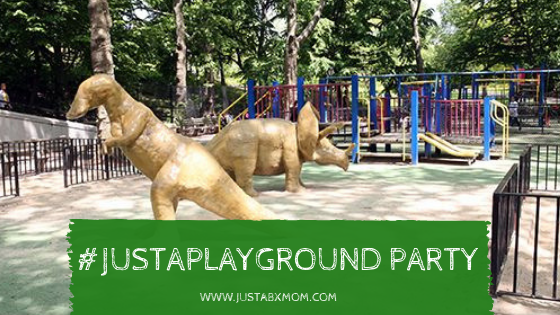 It’s been a busy week but I couldn’t wait any longer to share the fun we had with our friends at our recent #JustAPlaygroundParty. This month’s #JustAPlayDate was a chance for our friend’s to enjoy some old school fun in the last days of sun and heat in NYC before Autumn comes and ushers in Winter. We hosted our event on the first day of Autumn at the Dinosaur Playground in NYC. Did you know that NYC has a Dinosaur Playground? It does. There are so many really cool playgrounds around the city and we loved getting the opportunity to check one out. I mean, who doesn’t love dinosaurs? That’s one of the really cool things about JustAPlayDate, it gives us the opportunity to connect with places, brands and people we might not have been familiar with before. And that’s what we did. We invited some new friends to hang out with us and loved working with a new brand, Harmless Harvest Coconut Water. The day was designed so that littles and parents could spend a little time unplugging. We went old school. We played with chalk, frisbees, jump ropes and playground equipment. Of course, some of the littles climbed the dinosaurs. Too often we get bogged down in over scheduling, running to events, and life in general that we do not take time to stop and just enjoy the moment. That’s what we did. If you ask me the parents had just as much fun as the littles. We all took turns checking out Goliath Game’s Zoom Ball. Let me tell you, it was so much fun and quite the workout! We even sent one of our lucky littles home with a Hydro Zoom Ball. Playing outside means that we need to make sure our littles stay hydrated. Autumn might not be as warm as summer but when you have ten littles running from the start until the end of the day they need replenishing. We were blessed to have found a new friend in Harmless Harvest Coconut Water. Overall, it was a fun day where even though we wanted to get our “perfect shots” our littles were allowed to, well, be little. And if you’ve followed me for a while you know that I’m not into playgrounds. I finally found how to enjoy them. I just have to make sure that I know all of the kids on the playground then I can relaz and let JustaBXgirl run free. How do you handle playground play? When was the last time you and your littles unplugged for an afternoon of play?